Before starting 3PP, I was heavily involved in contributing to specialist tech sites, which comprised of writing tutorials, giving tech support and reporting the latest developments. Spanning a decade, this exposure gave me a deeper understanding of how the web works, and how people will use others to draw traffic to their sites. Whilst this type of thing is rampant in the tech world, I thought I would be free from it when I started posting about artists and events from long ago! However, as is the case with anything on the web, popularity attracts a degree of attention. Most of it is good attention, like having wonderful art historians and authors regularly commenting on my posts, but some of it is bad. 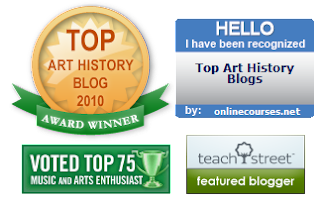 I am writing this post to highlight how art history bloggers (among others) have become the latest target for online education referrers of inscrutable integrity to use our sites to advertise their services. How do they do this? One of the most commonly used methods is by the creation of a "toplist." This entails a blog post or web page that lists the "Top 50 Art History" blogs or something similar. On a cursory examination, many of the sites that become listed are indeed quality sites - this is because these unscrupulous advertisers have done their research and determined the most highly visited web sites on this topic. In addition, as art history bloggers are increasingly a close-knit bunch, you will eventually be able to extract high quality sites by monitoring blog rolls of various sites and matching them against each other. Hence, the similarities in my blog list, and say that of Alberti's Window, Art History Today and Every Painter Paints Himself etc. will give you a solid list of quality sites. It is interesting to note, art history sites that do not have 'blog rolls' do not appear on this list as prevalently. This highlights use of these rolls by these advertisers to determine who will comprise their toplists.This is likely a compromise made because art history sites do not make a huge enough splash on Googles PageRank. Page ranking is a fascinating topic for those into the true nuts and bolts of the web. A lot of it is mathematical in nature, as numerical constructs are used to represent the actions and online habits of the approximated 2 billion people that now populate the world wide web. 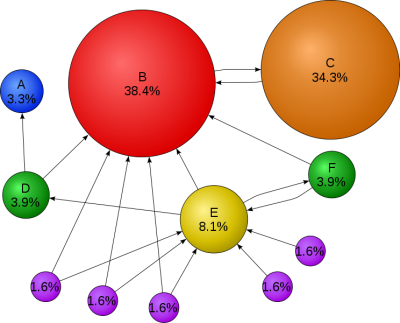 PageRank schematic: You dont need to be a math wiz to see the proportion of sharing/traffic is not even! Who are these sites creating toplists? It is vital note that the sites creating these lists are essentially lists/directories themselves. It would be one thing to have an actual online education provider personally recommend your site and encourage its use by their students. This is NOT the case. The services exist purely to attract traffic to their site and generate enrolment to online courses, for which they would receive a referral bonus. This may be financial, or an exchange for other information, such as names or contact details of refererrers, or simply a swap of lists garnered by their ongoing researches into what sites are becoming popular in a particular field. I know some reading this are thinking its nice to have these lists created as a way for people to find our sites easier. That is fine, as long as you don't fall for the next step in their strategy - the crux of why these toplists are created in the first place.There are indeed some toplists that are created for no other reason than promoting a topic, but quite often this is not the case. Once your site appears on one of these lists, it is not a long time until you will hear from one of them. The referrers I have heard from most recently are TeachStreet and Mastersdegree.net. Online PhD was another list that created a toplist last year, and promptly sent out their badges to the sites which appeared on them. These sites will eventually write to to you, and politely ask if you wouldn't mind listing their badge on your site. In my experience, they are not pushy or demanding in any way, but the fact that they are asking for ad space for simply having created a list with your site on it is improper. They have no real concern about art history, nor the blogging community on this topic. At the end of the day, it is at the discretion of the blogger to decide whether or not to have these badges on their site. I just wanted to write this post so people are aware of the true motivations behind it. The benefits to those providers far outweigh the spike in traffic you may get. If you really want to add your page to a blog list, consider a place like Networked Blogs or Invesp's blogrank. There are many other similar sites purely designed to attract traffic to your blog, without the underhanded advert request. 1. That you are opposed to the use of corporate advertising on blogs. 2. That you feel the use of corporate advertising on blogs devalues the medium. 3. That you do not accept money in return for advertising space on your blog. As with anything of quality, if you do a good job on your posts and work hard to make your content interesting and engaging, people will come regardless - toplists are not required! If anything, this business has made me realise I need to hurry up and publicly announce the resource I have been working on to promote art and history blogs - which will be revealed in the not too distant future. In the interim, please be weary of toplists. If you really do want to make something from your blog, consider activating Google AdSense or being part of the Amazon affiliate program - which can earn you Amazon vouchers as people click off relevant advertisements embedded in your blog. At least this way, you are in control of what your site is advertising, and you receive the benefits from it. For another example of the same hustle being pulled on other blogging genres, see this post at The Endless Further, a site usually dedicated to Buddhist History and Philosophy. Reading the trite descriptions of each blog offered highlights the poor degree of knowledge list creators have of this topic, and what our sites are actually about. These descriptions highlight their poor familairity with our content, instead using our blog and profile desciptions to provide their information. The heavy presence of the Sherlockian element of this description shows how it was lifted from my profile page.Whilst the periods covered are essentially correct - I have not done a post on Surrealism yet, excluding the one on Fellini's Satyricon perhaps. Here they've obviously latched onto the link to Leon Battista Alberti, but the topics listed show a very cursory, even lazy visual examination of Monica's post labels. It's just not right! These are the type of badges you need to look out for. If you see them on another blog please inform the owner of this post! Be vigilant, and these sharks will go away! Thanks so much for explaining what's going on with these lists. I had no idea. On a side note, the trite descriptions of my blog on the list really bugged me - I could tell they didn't have a good understanding of my interests or the purpose of my blog. Thank you for the comments Ben and M! I definitely did not want to make any fellow bloggers upset with this post, but I just wanted to let everyone know that this crowd do not operate with our best interests in mind! So many art and history bloggers do amazing, inspirational work they should be proud of. Recognition of this will come in the form of traffic and regular visitors. These are the best ways of measuring that you are having an impact, not a badge from someone hawking their own interests. I'm going to edit my post to include the descriptions my blog recieved, it highlights that they don't actually pay attention to what we do! All I can say is - spread the word! They'll go away when they realised the jig is up. I wasn't sure but I think you hit on a very telling moment i.e "It is interesting to note, art history sites that do not have Blog Rolls do not appear on this list as prevalently". I hadn't noticed it, but what other explanation is there? Blog rolls are a very easy, highly visible shortcut for these faux researchers to get the information they need. It's quite time intensive to filter results by statistical methods, hence those with elaborate blog rolls will appear more commonly because the quality control process has already been done by that blog author! Yours and Art History Today's blog rolls/resource list are among the most complete, which explains why your respective sites appear more often in these lists. eg. In the sample of 6 above, your site is in 5 of them! I'm pleased that you now have a better understanding of what these sites are up to - which was the purpose of this post! I've done a post on this myself. 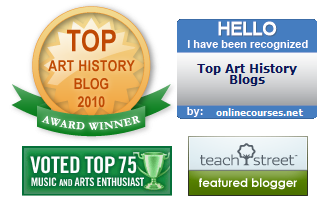 One of these sites described my blog as art history trivia! as H knows I've removed my badges. Good riddance to these scams. Cheers David! 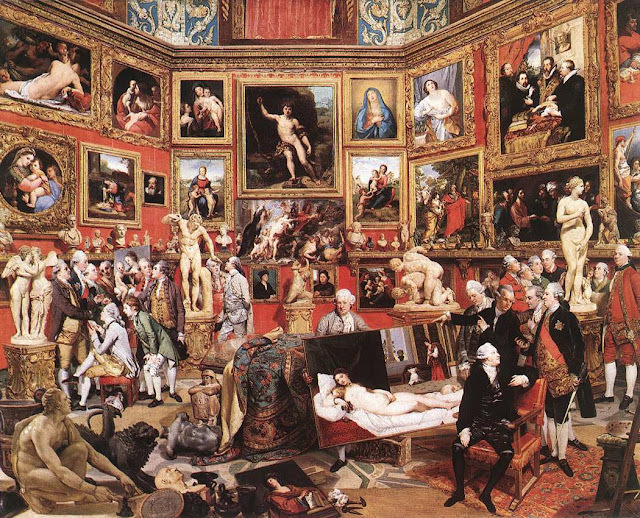 Your is the last site I would describe as art history trivia! This post has been extremely well visited over the last two days. It's fascinating to note that a google search for 'art history blogs' will make you find these lists first. This demonstrates how they are designed with Search Engine Optimisation(SEO) in mind first and foremost, as opposed to representing this topic in any accurate way.